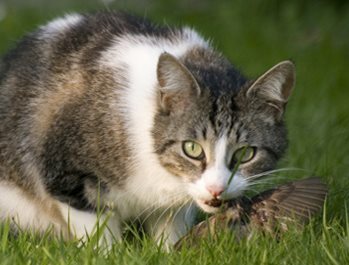 Cats Kill Birds - Should We Keep Cats Indoors? It is estimated cats kill 2.4 BILLION birds each year in the U.S. If you love your cat and you love your backyard birds, then don't mix the two. Keep your cats indoors or supervise their outings. They will live longer, healthier lives and so will the birds! Make sure to install feeders where cats don't have easy access to them. Because even if you keep your cats inside, there's always the neighbors & other strays looking to play predator-prey. I have the photo of my cat below sitting in a planter of grass inside, but I do allow her to go outside too. We plant the grass during the winter to let her graze on when she wants and during the summer months, I let her out to graze on the backyard lawn, but only when supervised. She enjoys sitting out in the sun, eating her grass and I do not want to deny her this - but she's never out of my sight. She also wears a collar with bells to help warn the birds. My neighbor's are on their third cat now. Why? Because the other two were free to roam wherever and whenever they like. One came home injured and later died, the other disappeared. 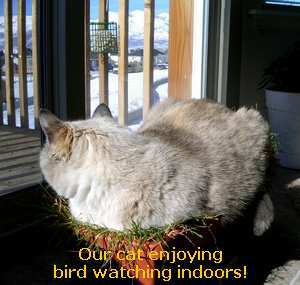 We highly recommend visiting The American Bird Conservancy page about the Cats Indoors! Campaign to increase awareness of the problem. I went to a presentation about bird conservation and when someone from the audience asked the speaker, a Conservation Biologist and Ornithologist, what is the single best action we can take as individuals to help birds, you know what he said? Outdoor cats commonly have a life expectancy of fewer than 5 years, while indoor cats is up to 17 years. Your outdoor cat is more susceptible to life-threatening diseases from other cats and animals, ticks and other parasites. They can become lost or get hit by a car (over 1 million cats are killed by autos annually), become injured in fights or poisoned. Indoor cats don't have this kind of stress on their health. Indoor cats can be happier, healthier and longer-lived which should make cat-owners happier too! Just remember to give your indoor cat plenty of exercise with toys. We play "chase- the-string" everyday...that's good for both of us! Attention all cat lovers and all defenders of wild and free cats that have contacted me after reading this page. I have left them anonymous, but if you want your name posted, just let me know. Just FYI, the data on this page is from the Cats Indoors Campaign, not from my personal insights or guesstimates. Keeping Cats Indoors is Cruel - Comparable to Jail! "Life expectancy info for outdoor cats is WRONG. I have had indoor/outdoor cats for more then 30 years. They have lived anywhere from 19 years up to 23 years. Outdoor cats are much happier then indoor cats. It is against their innate nature to be kept indoors 24/7. It is comparable to jail... do you not know anything about the mental, emotional, physical needs of cats? I live in the country, and have NEVER had one of my cats hit by a car. I see that they receive good veterinary care; I have a cat door, and they come and go as they please. My sister lives in a condo in city, and aside from brief visits on porch, they are kept indoors and her cats are sick off and on (one of her beloved cats just died from urinary problems.)" "Highly disagree with your cat indoor policy. Heck, if we all went to jail, (even a really nice jail) no more murder...in fact, no more crime, no more traffic fatalities, industrial accidents, or natural caused fatalities! well, you get my drift. 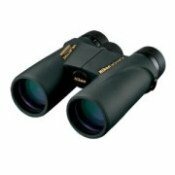 I am an avid bird watcher and photographer of all sorts of wildlife, and I also have 4 cats and a dog which I love as much as the wild animals I spend so much time around. My domestic animals will never be locked inside! And by the way they will live and have ALWAYS lived more than 5 years. What do you mean by outside cat? A city feral cat might live 5 years but you do an injustice to yourself and your readers to even hint that a spayed and vaccinated cat that is non feral will only live 5 years if let outside. I have had at least one cat of one type or another for 40 years and I have never had a cat live less than 14 years and ALL HAVE BEEN LET OUTSIDE DAILY! By the way, got any statistics on how many birds are killed by cars every year? Add that to the 50,000 human deaths and 250,000 serious injuries caused by automobiles every year and maybe you should be trying to get us all to be "indoor only Humans! Well, there is my rant. Got here looking for bird feeder plans but your Cat incarceration drive got me all riled up." "I adopted my cat from PetSmart. When I first got him he was starving and skinny seriously to the point he was just bones and fur but since he's been with me I've been monitoring his health and he has everything he could ever want. Since I live in an apartment I made him an indoor kitty, he hasn't been out once since I got him except for our patio and he just has that longing look all the time to get out. Honestly I don't believe a cat should EVER be declawed. For one it really hurts them. Two even if they're indoor cats they do still have an instinct and can choose to escape anytime and his claws are his weapons. Three cats are natural hunters they should be able to hunt it's not fair of us to suppress those urges for them. "I'm sorry- but I live with 5 feral, spayed cats in the area. If I let my house cats out, there would be fur flying! Also, two of those outside cats sit under the bird feeder or the birdbath and just wait for the birds to land. Yes, I have often seen them take birds. We haven't seen a Northern Flicker or a Towhee in months- both are ground feeding birds. We used to have them, but not since the cats showed up! Cats will hunt, even if well fed. They're great around barns and storage areas where mice are a problem, but I don't need them hunting the birds and using my mulch as a bathroom." "It's a personal choice...all of my cats over the years have been strictly indoors and lived long happy lives...they are spoiled with all the attention they could have ever wanted and places to sit in the sun ...my cats whenever they have "escaped" have panicked and come right back inside...it's all they have ever known. Feral cats, stray dogs, raccoons, coyotes etc. are all a grave danger to pets (including dogs) and quite frankly I would never put a beloved pet in that kind of danger. Domesticated cats are NOT part of the ecosystem and only hunt because of the innate instinct built in to their evolutionary past...you can take the cat out of the hunt but not the hunt out of the cat. I grew up on a farm...our farm cats were indoor outdoor and kept the rodent population in check very well...we did however have a couple that were indoor only...they were the ones that lived the longest healthiest lives...the indoor/outdoor cats were constantly @ the vets for one ailment/injury or another and generally died at much younger ages and sometime rather brutally at the hands of other wild critters or cars. mine stay indoors...safe and happy. my choice, period. "I use to live at the Grand Canyon Village and had two cats of which I never let outside. That was just because I lived in a location where outside cats became part of the food chain. If you had an outside cat for more than 5 years you were lucky and that cat was smart. My indoor cats were leashed trained and walked daily, they were allowed to have monitored playtime outside. I would bring in outside things like snow, and pine needles for them to play with. 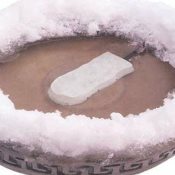 They loved this and one cat looked forward to the snow in the tub. The argument for cats being in door, or outdoor, depends on the location of the cat. We (humans) can affect the environment in which we live in. Cats cannot and just adapt to their environment. "I not only dislike having my bird feeders turned into a buffet for the neighborhood cats, I also have to protect my dog from them. I've had a very nice Doberman blinded by a cat who had no business in our yard where the dog belonged. I also hate having my black car covered with cat foot prints which will etch the paint in time. "I think you were very reasonable and fair to let the "cat defenders" post their comments. But I have to add my two cents in as this is an issue I care very much about. There is no logic in the statements from the "cat defenders". I have very happy and healthy cats AND dogs AND I love to observe wild birds. I never leave my pets out unsupervised. If they don't come when called, and are therefore not under my control, then they get put on leash or in a run. "Hello, I just came across this website and would like to share my experience. I have 2 kitties who are allowed both indoors and outdoors. Prior to me and one of my cats moving to our current location, this particular kitty was an avid catcher of birds; almost every day. Being an animal lover of all animals, I surely felt sad for the birds, and also wanted my kitty to be able to go outdoors as well. I have trained various animals ever since I was a kid; I grew up with all kinds of animals and trained the 2 kitties we had then to get along with my Dad's pet mice! Later on, I trained 2 different cats to get along with a baby bird I rescued. I then decided to create a program to teach my kitty "Lucy" to not catch birds. I created my own program for her, and worked with her over a span of about 6 months. After that I kept reinforcing her new behavior. The next several months she caught 2 birds, then none. My kitty did indeed learn through consistent kind training to LEAVE BIRDS ALONE! She has had an amazing "BIRD-FREE" for several years now. When we moved to our current location, I worked with Lucy to make sure that she continued to not catch or bother birds in our new location; (we are in the country now, plenty of birds around!) She has maintained her excellent record of not catching any birds for several years now! At the time I was teaching her, several people told me: "Oh you can't teach a cat to not catch birds...it's just their nature to do so." I did not, and do not believe this, and Lucy is proof that it can be done! A cat CAN be taught to not catch birds! Recently we adopted another kitty, Andrew, and he too went through bird training, and has successfully learned to leave birds alone. You Think Your Cats are "Bird-Free"? "No offence, Ann...but unless you are with your cats every minute they are outdoors, I think you are probably mistaken about their never killing birds; YOU just aren't there when it happens. If, on the other hand, you ARE with your cats every second they are outdoors...you've got too much time on your hands. "Cats and bird strikes at reflective glass at urban buildings are the #1 killers in the world when it comes to songbirds at the very least. It's on every single website about birds you will ever find. Billions of birds are killed by these two aspects of our society. And cats create additional problems by being allowed to wander everywhere and crap in other people's well kept flower and vegetable gardens. They are an invasive species, and not a natural predator to birds. They were brought in by humans in the same way that other invasive animals were brought in to deal with problems (i.e. in the case of cats it was mice and rats) and then the invasive animal took over predating on other creatures. Cats are fine inside, however birds are far more important and with all the latest information on how we are losing our songbird population and how over 70% of some bird populations are gone because of cats, building lights at night (because songbirds migrate at night not in the day), destruction of habitats, pollution, etc., (and not car strikes, who ever said that?!?) the birds should and do take priority. Reckless and careless and selfish cat owners will see their cats lost to coyotes, hawks and other raptors and in our neighborhood, the bylaw office offers cages to trap wayward cats. What we do with them is up to us. Take the neighbor to court, or just take the cat out into the country and let it survive the way feral cats do. Maybe drop it off at a farmer's yard so that it can learn to hunt mice if it's so set on displaying its wild ways as some cat owners claim. If people don't care enough about their cats and let them out, then why should others who are trying to protect their backyard songbirds care? I don't mind cats as a whole as long as their owners keep them under control as dog owners are required to. There is no such thing as a cat "needing" to go outside. If you feel you need to let your cat outside because it is meowing too much, then train it. Cats can and have been trained in the past. If you're too lazy, then send the cat out to take its chances but if I had to choose, I will choose beautiful wild birds any day over pesky invasive cats in my back yard and I will do what I need to to keep them out. 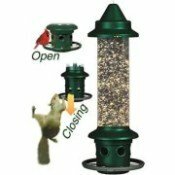 Install a Squirrel Baffle - Helps prevents squirrels getting to your feeder and cats from getting the birds.